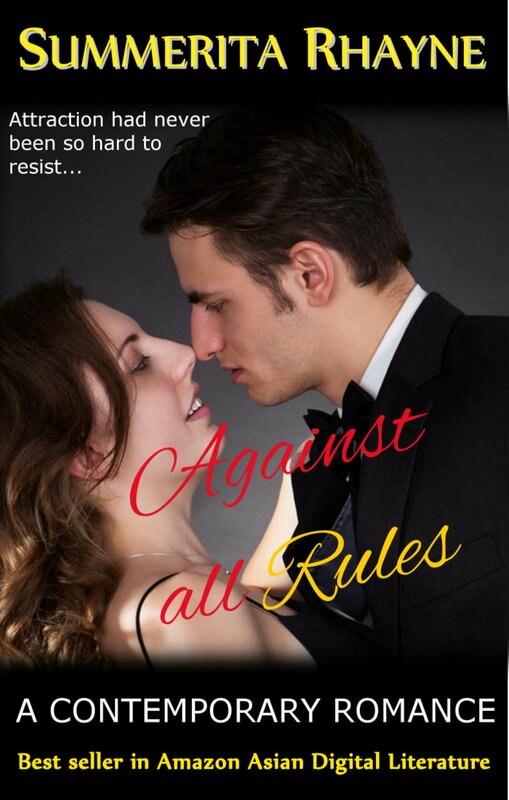 An excerpt from contemporary romance Against All Rules. The dialogue starts with Tahir. In this, Tahir finally admits he’s attracted to Samara. Tahir saw the surprise in her eyes as her head jerked up. ‘Last night, it wasn’t about Elaine, all I could think was how to stay away from you…’ Was he confessing this to her? This was wrong but as though he was compelled to say them, the words were forming. ‘Then today on the dance floor…’ At last he saw the acknowledgement in her eyes. They softened and glowed as though she was reliving the surge of sensations they both had been enveloped in. How could this girl, whom he would have said he was unlikely to find desirable, arouse such a potent awareness in him so that he found himself locked in the hazel pools of her eyes, pulled in till he had no volition left of his own and was only dimly aware when he found he was cupping her jaw, bending to kiss her and then it didn’t matter because a bare couple of inches didn’t take much to cover. Not when he was being sucked in by a force larger than his resistance. Not when the prize was the contact of her soft lips. He needed to touch those, have them under his, taste the ripe flavor of her heat, soft and sweet and infinitely giving. Then he was tasting it all. Arousing. Passionately generous. He wanted it to go on forever. He wanted to end the light exploration and deepen it into complete abandon. He let his tongue trace and probe the sweetness, his hands curve on her soft form till the awakening of his senses gelled into a muscle tensing awareness of her that he could feel hardening at his crotch. Yet he couldn’t let go. His hands moved and cupped her breasts, exploring curves that demanded his touch as though made to be possessed by his hands. Heat grew into a bold tension, a throbbing that craved release. He could feel his blood pound faster through his veins as he drew her hard against his body. She felt so good that it wasn’t enough. He wanted her losing that precious control, hair splayed, her body arching in need, his name on her lips as she enclosed him in slick heat.